People born in the period from 6 February 2027 to 25 January 2028 patronize Fire Goat. Quiet and peaceful animal, sometimes able to unexpected behavior. 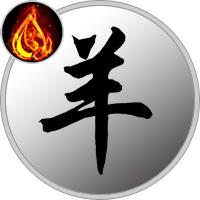 The dominant element - Fire, spark which gives a vivid symbol of the year temperament. Emotional, impulsive Fire Goat stands out from the rest of the representatives of this sign. The color of the year - the red symbolizes energy, vitality. Fire Goat endowed with a developed intuition, courage, determination. She skillfully hides his insecurity under the guise of being a fun and relaxing. The rich imagination paints a beautiful picture in my head giddy goat. She tends to exaggerate the simplest problems. As a result, it makes life difficult for themselves and others. Do not know how to calculate their actions until the end, prefer to remain in blissful ignorance. Too disparagingly refers to money, it is easy to spend their lovely trinkets and baubles. Rashness in action sometimes brings a lot of trouble to her family and friends. Bright temperament, inclination for adventure can be attributed to the merits of this sign. Needless impulsive person has a weakness for theatrical effects. Although inherently Goat is straightforward and sincere man. It is easy to imagine a buddy, quickly go to the contact. He likes to be in the circle of his friends and associates. Willingly helps people in need of assistance. For Goat, it is important to the opinions of others, so it will try to keep their whims. He likes large-scale events with large crowds. Creative Goat, despite its lightweight nature, capable of action. If necessary, mobilize forces and take the right decision. Her energy is enough to carry out our plans. It is important to evenly distribute force, otherwise it will fizzle before reaching the end. Financial activities - not her strong point, she can fall into the trap set by pragmatic partners. People this year, well proven in the following occupations: journalist, lawyer, builder, engineer, diplomat and literary figure. Fire Goat dreams of a strong relationship. In her presentation of the family should serve as a reliable protection from the outside world problems. It seeks to choose a strong partner who will take care of her. Goat created for a quiet life, in which there is the daily hassle. In this case, it can flit carelessly in his fantasies and dreams. He likes to harass her suitor whims and all sorts of oddities. Adores gifts and attention, he prefers long courtship. It may take a decision itself, but will not be imposed against the opinion of her. To opt for safe and loving hands and energy to spend on something else. The ability to create a comfortable family nest, which will reign comfort. Sometimes too it finds fault with the partner, excessively exaggerating his faults.